The Challenge Brief will be the basis for all your work in the following stages. As such, you should outline any key risks regarding the problem, and assumptions you may have made, and finally any outstanding questions you have. See Manage risk for how to develop a risk matrix. For assumptions and questions, review all the information you have gathered in the previous exercises and list the questions that require further research and the assumptions that you will need to track or test. This document should not be long, preferably between four and eight pages. 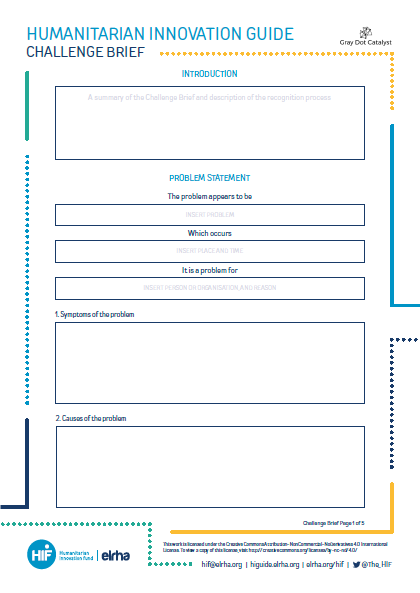 It is a document that is seeking to distil your knowledge about the problem area, and be a call to action for trying to identify or invent a solution. You can reference and use annexes to add more in-depth information.